Collapsible Foldable Dog Puppy Pet Travel, Portable Water Drinking Bowl. 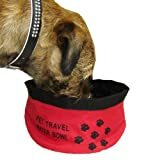 •Ideal for use when travelling with your pet & collapses for easy storage. This entry was posted in Aquatics and tagged Assorted, Bowl, colours, Outdoor, Travel, Water, WORLD by One Boutique. Bookmark the permalink.